It is a landlocked city, but water is and always has been the red (or should that be blue) line running through Antwerp. Indeed, it is hard to imagine Antwerp without the River Scheldt – the city boasts a long and proud maritime history. Though arguably better known today as being the diamond centre of Europe, Antwerp actually has a maritime academy, a university where officers of the Merchant Navy and Belgian Navy are educated. Marine officers have, in fact, been trained in Antwerp as far back as the 14th century when Napoleon’s plan was to make the city a base of operations against England, “a gun pointed at the heart of England”. There is still a bracing, business-like air to this historic port city, roped to the broad estuary of the Schelde. Today, the modern commercial docks are away to the north, occupying an expansive 13,500 hectares. But central Antwerp still retains a maritime flavour, with the old docks and warehouses now imaginatively transformed into galleries, hotels, museums and restaurants. But the maritime dimension remains the one consistent thread in its history. The romantic Victorian images of cruise ships, ladies with parasols and gentlemen in top hat and tails disembarking onto cobbled streets from cruise liners has never really left the Port of Antwerp. The saying goes, “The Scheldt River owes its existence to God, Antwerp owes its existence to the Scheldt River”, and this has never rung more true than today. The river has always brought economic prosperity with it, starting in the 15th century when it was the economic heart of Europe. Thanks to the Scheldt waterway, Antwerp is now the 2nd largest harbour in Europe and the 4th in the world. The Port of Antwerp handles 167 million tonnes of cargo per year. With its recent investment in the cruise ships infrastructure, such as the restructuring of the Scheldekaai, the purchase of a world-class automatic gangway and the construction of the cruise terminal and coach parking, the city and the port have achieved their vision as a harbour for tourism. The expanding port of Antwerp unfortunately led to the demise of various polder villages, but the beauty of the Scheldt polders continues to draw in those who know the area. To the north of Antwerp, the Scheldt meanders through a green and expansive polder landscape, ideally suited to cycling and walking tours. For example, you can go to Lillo by bike and use the free ferry service departing from Doel (between Easter and end September, regularly on Saturdays, Sundays and national holidays). Another refreshing walk is through the ‘verdronken land van Saeftinghe’ (the nature reserve of the drowned land of Saeftinghe), or 3,580 hectares of schorren (marshes with brackish water). Antwerp is never one to stand still and the world’s biggest lock is being built at the Deurganck dock. There’s even a new comic strip to mark the achievement. De Havengeest (The Port Ghost) takes readers back to the 5th century, to the very beginnings of what has become one of the world’s leading ports. Construction is on schedule with the opening planned for September 2015. Much of Antwerp’s story is told at the new Red Star Line Museum, which has already become a cultural and heritage landmark with 200,000 visitors expected each year. “Following emigrants” (3 hours) – You follow in the footsteps of emigrants from their arrival at Central Station to the Red Star Line buildings located in the Eilandje quarter. “Looking for the Red Star Line” (2 hours) – This walk traces the legendary shipping company in the Eilandje quarter and its role in the development of the port. “Bank and embankment recreated” (3 hours) – It tells the fascinating tale of the origin and growth of the historic city centre. Step by step you learn how the river bank, dunes and canals were transformed throughout the centuries. Hidden parts of the city walls, strange place names, vaulted canals – known as ‘ruien’ – and historic facades reveal its fascinating past. “Touring around, and in Mas” (2 hours) – Just north of the red light district the old port district of the Eilandje is getting a second chance. Port operations are making way for water tourism and a spectacular urban renewal process. Between the Scheldt, the picturesque old docks and the new ‘Park Spoor Noord’ landscape park, the town council and developers are building an attractive neighbourhood. You can also take a two-hour tour of the port, one of the largest industrial areas in the Benelux. You learn more about the revolutionary world of the container and the port’s operations. Another must do is a visit to Zuiderterras, a pier that leads out into the River Schelde to an exhilarating modern building with unparalleled views of the estuary. 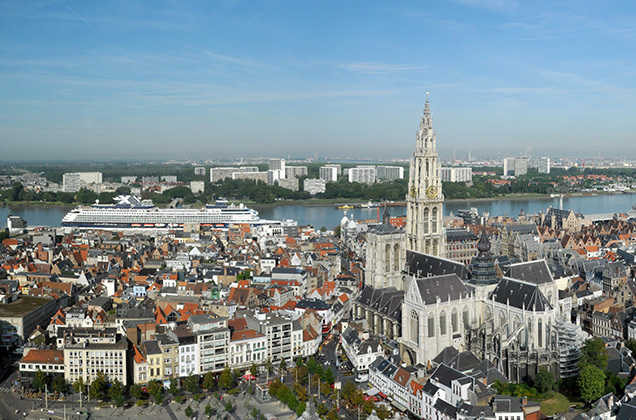 A few hundred metres from the city centre, dozens of sea cruise ships and hundreds of river cruise ships moor every year, bringing tens of thousands of tourists to Antwerp’s city centre. Most larger cruise ships dock at Wandelteras Zuid, a five-minute walk from the city centre while smaller vessels stop at Kattendijkook or Willemdok, around 15 minutes from central Antwerp. Antwerp Tourism & Convention has information on how to make the most of Antwerp’s millennial port history. If you do find yourself navigating the city’s fascinating maritime past, you should also not forget to splash out a little on the regional delicacy: eel in green sauce. Like Antwerp itself, the dish is well worth the effort.